Noah Ananie aka Papa flava is a rising reggae star in Ghana, he began his career in a band called 'Th 4 Kwages'. After touring all over Ghana with Th 4 Kwages, Papa Flava decided on a solo career. He released his first solo album in 2007 called 'PAPAYE' (goodness). Papa Flava has toured with leading Ghanaian artist Kojo Antwi in Ghana and the Ivory Coast. This bought out the full flava of Papa Flavas talent, he went on to release his second album in 2011 self titled 'PAPA FLAVA'. Which featured big tune such as 'Carina'. This year 2012 he has released his third album 'Back Again' and has made it all the way to tour Australia. 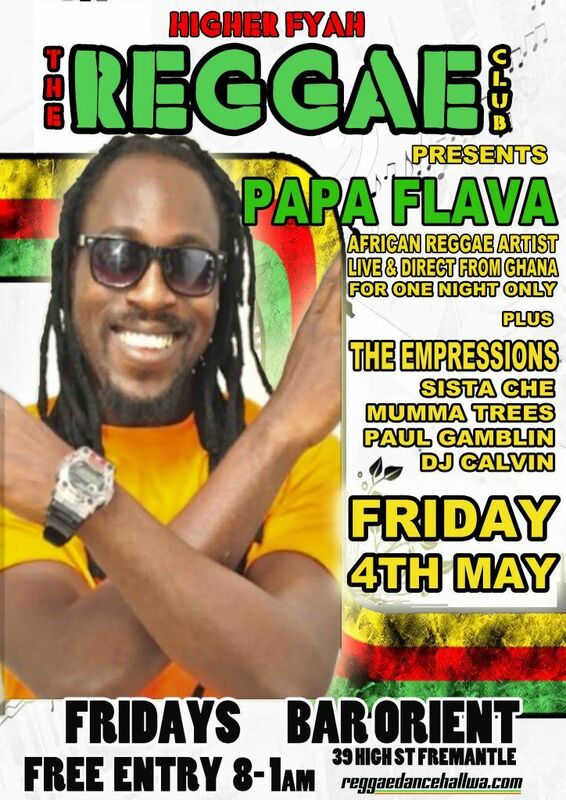 Papa Flava will perform at Higher Fyah-The Reggae Club on friday 4th May 2012 and bring his unique Ghanaians Reggae Flava to you live and direct! Ghana has a lively reggae scene come and see a slice of it for yourself as Papa Flava explode on stage at Higher Fyah-The Reggae Club Bar Orient High St Fremantle, Friday 4th May. With support from Paul Gamblin, Dj Calvin and The Empressions.